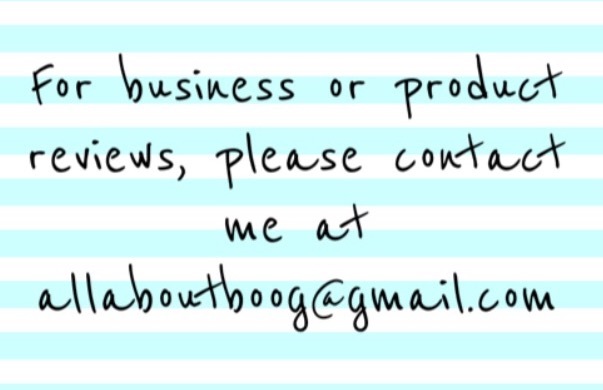 No Matter the Topic, it's All About Boog: You Want a Piece of Me? Anyhoo, I just wanted to chat about my opinion of the symbol for Autism, the puzzle piece. This is **just** my opinion and I am by no means trying to throw any sort of shade or spill any kind or flavor of tea. 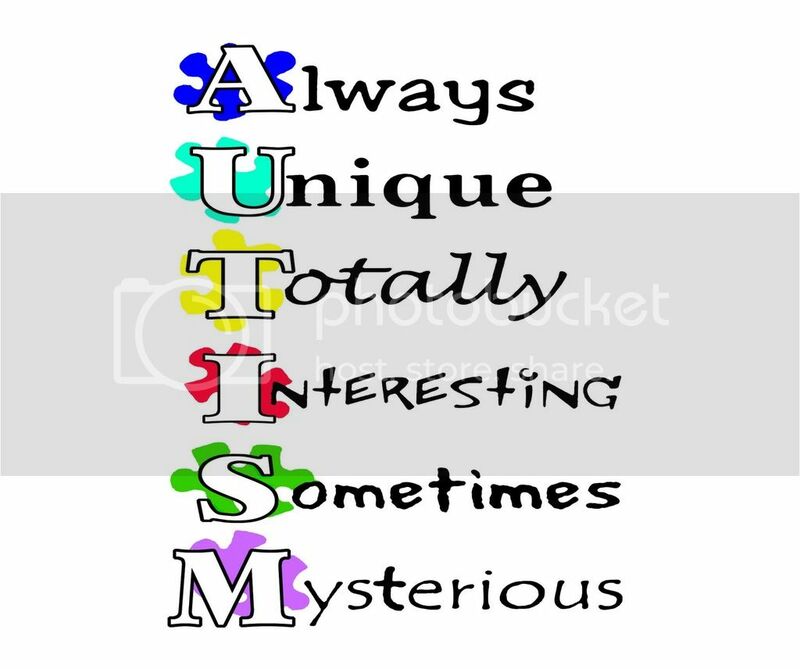 I am actually VERY thankful for the puzzle piece because it is a symbol that makes people think of Autism and isn't used by any other group. For example, the primary colors are also used for LGBTQ+ people and the color blue is used for several other types of awareness. Now that that's out of the way, I want to explain why I'm over the puzzle piece. Initially Autism was even more misunderstood and incredibly difficult to pinpoint or even define than it still is today. It totally makes sense - we need to complete the puzzle - we don't know why/how/what Autism really is. It's a puzzle and we need the missing piece(s). There are so many theories and studies being done because we still don't know everything about Autism. However, we know a lot more than before and for that I am truly thankful. I guess what I'm trying to state is, I'm not looking for a piece of my son that's missing. My son has Autism and if he didn't he would be a completely different child. I don't want a completely different Boog, so I have all my pieces - does that make sense? Now that I've been an Autism Mom for several years, I look at the spectrum in a much different way. Yes, I do want science to continue to come up with ways that make life easier for people with Autism. 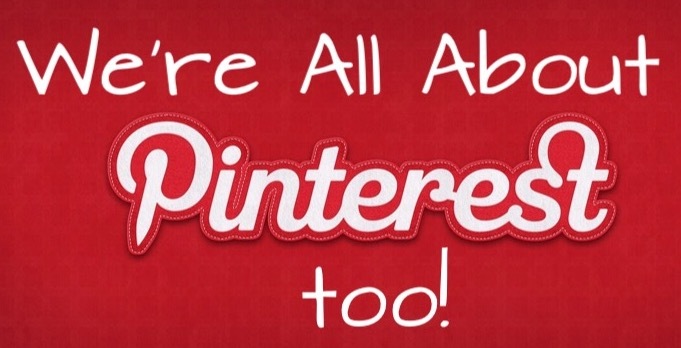 Things like communication, sensory issues, socialization and more. If you think about it, that statement could be used to describe a million other things. We know it's there, we want to help, we need to go forward to help. 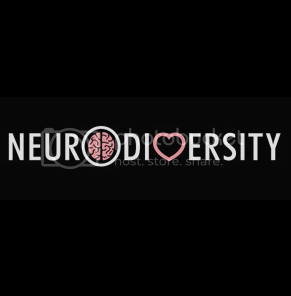 I choose to use "Neurodiversity" as my focus. To me it means that there are many, many people of whom think "differently" and we need to celebrate those thought processes too. Neurodiversity isn't just for Autism, it's also about supporting people with ADHD, OCD, BPD, Aspergers, and about a thousand other things that make people who they are. These diagnoses describe a part of who that person is and if removed, most would be a different person. The entire definition/explaination can be found on Wikipedia here. Look, I am no scientologist trying to say that mental illness doesn't exist or need treatment. I'm also not going to jump on Oprah's couch or call anyone "glib" either. I just mean that we're starting to understand just how many people think differently. Those people shouldn't feel they are beneath anyone else. Different does not mean less. I can look back at my high school and college days and think of so many kids that were just thought of as extremely shy, when in reality they may have had Aspergers and social situations were very hard for them. 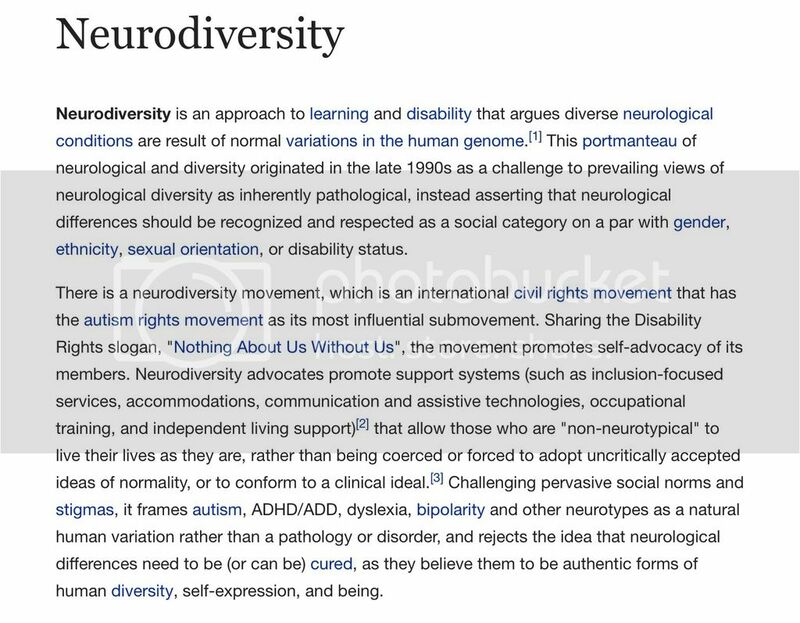 So by celebrating and supporting neurodiversity you're including many types of people under that umbrella. Good news: the umbrella is massive and we have room enough for all.